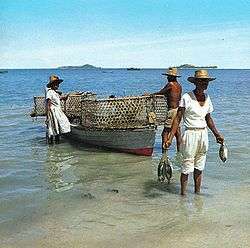 Artisanal fishing (or traditional/subsistence fishing) are various small-scale, low-technology, low-capital, fishing practices undertaken by individual fishing households (as opposed to commercial companies). Many of these households are of coastal or island ethnic groups. 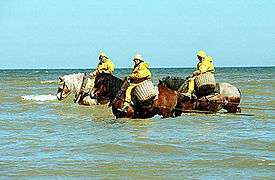 These households make short (rarely overnight) fishing trips close to the shore. Their produce is usually not processed and is mainly for local consumption. 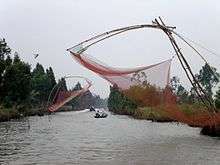 Artisan fishing uses traditional fishing techniques such as rod and tackle, fishing arrows and harpoons, cast nets, and small (if any) traditional fishing boats. 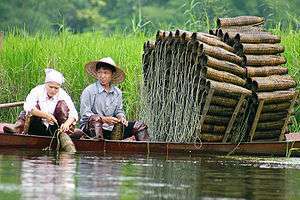 Artisan fishing may be undertaken for both commercial and subsistence reasons. It contrasts with large-scale modern commercial fishing practices in that it is often less wasteful and less stressful on fish populations than modern industrial fishing. ↑ Garcia, S.M. (2009). "Glossary". In Cochrane, K.; Garcia, S.M. A fishery managers handbook. FAO and Wiley-Blackwell. pp. 473–505.